I have 2 samples to compare using beta-diversity. I’m unable to figure it out where to trim them. I would suggest that you show this to the sequencing facility. It look like there was something weird with the sequencing of your samples. If you go to the Tutorial Moving Pictures - Demux Visualization - specifically at the Interactive Quality Plot tab, you will see how more or less how your quality plot is supposed to look like. 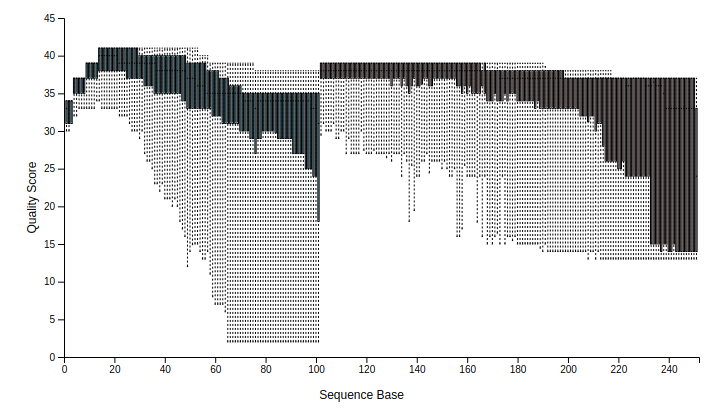 I don’t have a lot of experience, but from what I have seen so far, quality plots are can have low quality nucleotides at the start and the end of the sequence, but not at the middle.